Christian theism is, at least in part, a set of statements or propositions believers take to be true. The study of the coherence of Christian theism is the consideration of the coherence of that set of statements. It is not a study of whether or not those statements are true but whether or not if they are true there is any explicit or implicit contradiction within or implied by that set of propositions. A contradiction is a relationship between propositions such that if it is the case that p, then it cannot also be the case that ~p. It is commonly suggested that among the set of propositions Christian theists hold there are cases of contradictions. If so, then that set of propositions is inconsistent and at least some of them are not true. One way to solve the problem is to say that though there is a set of propositions that are true, there is no adequate way to express any of them in natural languages because human beings are not sufficiently well equipped to grasp any of those propositions. Perhaps only God has the capacities to grasp what is true of his own nature and we human beings cannot. Consequently, though saying “God is wise” says something, it says nothing about God. In fact, on this view, there is nothing we can say about God at all, at least when it comes to natural languages of the human community. The most obvious problem with this view is that it implies we are able to grasp one proposition about God and express it adequately in natural language, namely, that God has the property of having true propositions about him that no human being can grasp. Another way to solve the problem is to deny that a set of propositions is coherent only if it is consistent. Some advocates of alternative logics deny that consistency is a necessary condition for coherence. There are, in other words, true contradictions. This view, while perhaps appropriate to some religions (Buddhism perhaps), is not something many Christians embrace and so its relevance is somewhat limited in the present context. I assume that the set of propositions that make up Christian theism are internally consistent. This does not mean we have got every detail right. In fact, there may be adjustments to be made in how we express what we think is true. Nor does this imply that human beings are able to grasp every proposition about God. Consequently, perhaps some apparent contradictions are just that: apparent. And while we can’t think of how they all might be true, God can. If so, then we can be justified in holding to propositions about God that contain or imply apparent contradictions. We are justified in holding to them only if (i) there is sufficient warrant for holding to them (perhaps because scripture explicitly states them or they can be inferred from explicit statements in scripture or because they are necessary truths the rejection of which leads to some absurdity or other) and (ii) we can come up with logically possible ways in which they can be consistent. All the above are standard and incontrovertible features of orthodox Nicene Christian doctrine. However, clearly there is a problem with coherence. If all the properties had by the Father, the Son and the Holy Spirit are necessary and sufficient for the Father, Son and Holy Spirit to be God, then according to the indiscernibility of identicals, the Father is numerically identical to the Son, the Son is identical to the Holy Spirit. The dilemma is as follows: either reject classic orthodox doctrine or embrace incoherence. Since the former is out of the question, the latter appears to be the only option. There are several proposed solutions to the problem. Here are four. First, one might deny the strict form of identity in play. Peter Geach suggested that we should deny that numerical identity is the only identity game in town. Geach argues for relative identity whereby the sameness of x and y depend on the answer to the question: same what? On this view, kinds are more fundamental than properties and so identity is kind dependent. We should ask, when we probe whether x is the same as y, as to whether x is the same kind of thing as y. 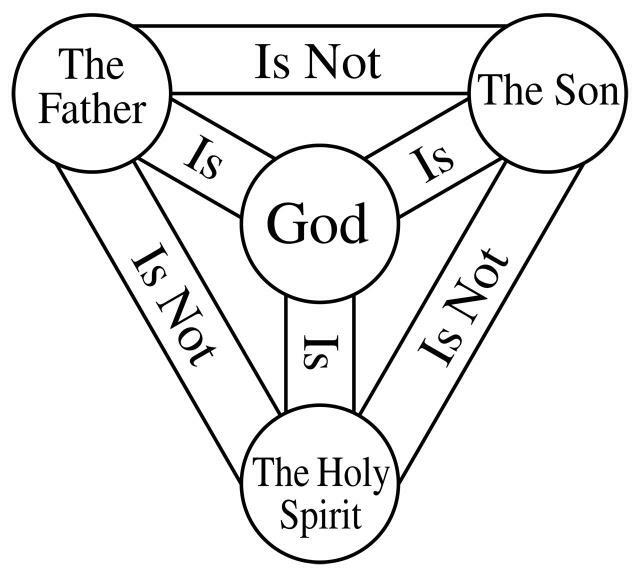 So put, it renders the doctrine of the Trinity thusly: The Father is the same God as the Son but the Father is not the same person as the Son. Second, perhaps the individuating factor is functional. Some have suggested that subordination in the economic Trinity is what we mean when we say, for example, the Father is not the Son. Though the Father and the Son are identical when it comes to essential properties, they do not share the same relational properties. The Son is subordinate to the Father and the Father is not subordinate to the Son. The most obvious objection to the subordination view is that if the property the Son has of being subordinate to the Father is an essential property or if it is necessarily true that the Son is subordinate to the Father, then the Father and the Son do not have the same nature. If they do not have the same nature, then monotheism is false. Third, one might attempt to reformulate what we mean by “one.” Do we mean that God is a singular entity or that there is a unique kind of unity among the members of the Trinity? Social Trinitarians suggest that unity should be taken in the latter sense. Rather than the three members being one being, they are three beings who mutual inhere one another. To say that God is one is to say that there is a perfect harmony among the members of the Trinity. Here is one objection: If there are three distinct centers of consciousness and three distinct “minds” that contain thoughts, then how is it that each person is fully divine? For what are thoughts? If thoughts are concepts or objects, then they “exist” within a mind or are created by an agent. But which agent? There are three options: One member has or creates thoughts (read: propositions) or the three members share equally the having or creating of thoughts, or thoughts exist outside the divine nature. If God alone is in a position to know how some state of affairs X that strikes us as metaphysically impossible is nonetheless possible (and indeed actual) then only an implicit assurance from God to that effect could warrant the belief that X is a mystery rather than an absurdity. Only divine revelation has the epistemic authority to 'trump' our natural intuitions about what is metaphysically possible and what is not. This view entails that we conceive of the doctrine of the Trinity in terms of what I suggested above in (ii) There is no way for us to see how some propositions hold together but we have maximal warrant for thinking they do. Since scripture serves such a role and it explicitly claims (1) – (7), we are warranted in holding to them. James Anderson, Paradox in Christian Theology (Eugene: Wipf and Stock, 2007), 265-266. Or cime to the realisation that scripture does not teach the Trinity. Since Jews and Unitarians have credible arguments against the Trinity and since there is a clear trend to trinitifying Christianity as evidenced by the development of the doctrine, a rejection of trinitarianism as an accretion is at least plausible.